Model cellar have a wide range of figure options and busts in a range of scales. They have a very useful but small selection of 1/35th scale items from replacement tank tracks to sandbag sections. Included in this range are a number of figure options both German and British. Recently re-released is a two figure set MC 35102 of two running British Infantry kitted out for the Somme or the later war period. 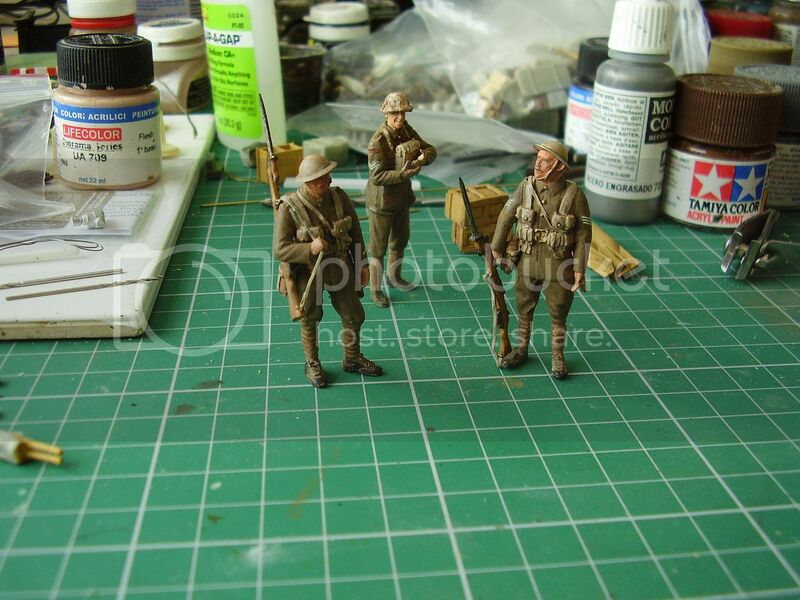 The set comes packed in a small sturdy box with the main parts for each figure in small plastic bags and a further bag containing the rifles and equipment for the two figures. The plastic bags are wrapped in bubble wrap and despite a journey from the USA all parts arrived safely without damage. Also included in the set is a strip of foil and an A4 page of instructions and information. On the box cover is a coloured image of the painted and completed figures plus product and manufacturers details. Both figures come with the option of adding either the PH type anti gas satchel or the later M1917 box respirator. Both figures are moulded in a light cream coloured resin. There were a couple of air bubbles in the moulds, one on the reverse of one of the backpacks and one on the foot of the 2nd infantry man but none that caused any real concern as a small drop of super glue as filler will solve the problem. The figure consists of 5 basic parts, Upper torso including head, separate arms and legs. Casting of the parts is well done, nice uniform detail with only a couple of small seems on the rear of the torso and back of one of the putties to deal with along with removal of the small pour stubs. The figure is dressed in period uniform with putties, the upper torso carries the belt and braces of the webbing with the buckle brasses in place. The rear brasses are on the reverse of the tunic on the separate lower torso/legs. The figure is posed running forward with the rifle at the trail. The head which is fixed to the upper torso looks forward has good sharp detail showing the face of a young looking soldier. The chin strap for the helmet is present and has nice buckle detail on the left hand side. The B5 ammunition boots, putties and lower tunic detail are also nicely done. Equipment comes in the form of individual ammunition pouches to be added, note the three bottom pouches are shown with the additional strap detail added as a result of experience in the trenches whilst the upper two pouches don’t contain this detail so check each one as you add them. A water bottle, bayonet scabbard/pick shaft, No 1 Bayonet, SMLE rifle, large pack and the two types of respirators mentioned above are provided to complete the build as is a helmet. The bayonet scabbard/shaft look to have the ends missing, and are a little too short. The shaft should hang slightly below the scabbard and the scabbard is to short when matched against the open bayonet blade. The box respirator lacks the two studs commonly seen on the flap and has no side fixing detail, neither are they any buckles present on the sides of the water bottle so some detail to be added there. The pick/spade carriers look a little too small to me and again no buckle detail is present on this item. The SMLE have a dimple on the RHS of the stock which will need filling but are generally very well done as is the No 1 bayonet. The helmets also look correct for the period. The 2nd infantryman is made up of the same sequence of parts as the 1st. The difference is in the pose which is one of running with the rifle held across the body. The half head on this figure is angled slightly to the right and top angled so the helmet sits at a slant. Equipment is made up of the same sequence of articles as the 1st figure and the same comments apply. Neither figure is provided with the small side haversack commonly see worn by the troops. The shoulder straps on both figures come only mid way down the back of the figures so the packs or alternative straps will need to be added. A broad strip of foil is provided to make straps and slings from. Normal safety precautions apply when working with resin. Clean up on the figures is minimal. I was pleased to see the re-release of these two figures. Whether used as a stand alone display or in a larger display they should provide the modeller with two decent WW1 attacking British Infantry. They will require a bit of work during the build, either the adding of straps or some of the missing buckle detail on the equipment but they have the right look and feel about them and should produce some pleasing results for the builder. Overall the standard of moulding and the detail on the kit and figures looks very good. Despite some obvious missing detail my only concern was the scabbard/shaft arrangement where the ends seem to be missing or cut short. A little TLC and you should have two interesting figures to add to you collection and I’d have no problem recommending them to fellow modellers. The poses look natural and the body proportions looking at the separate parts look good. As advancing infantry of that period they fit the bill well. Lets hope Model cellar continue to expand their range of 1/35th scale items, including their figure range. Highs: Good casting and generally very good detail. Realistic poses.